Work by Bay of Plenty Regional Council and J Swap Contractors Ltd. to restore estuary health by returning freshwater flows from the Kaituna River into Te Awa o Ngātoroirangi Maketū Estuary is now ahead of schedule. After re-opening for the summer fishing season, Ford Road access restrictions will return from 8 February to allow river re-diversion construction progress to continue. Culverts being installed at Ford Road to allow the return of freshwater flows from Kaituna River into Maketū Estuary. “The first sod was turned on 12 June last year. 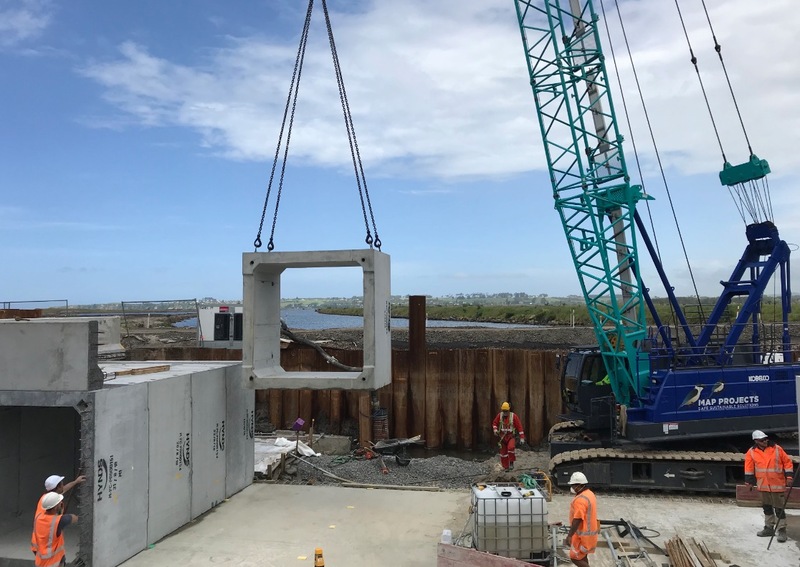 We expected the project to take two years to complete but we’re already nearly halfway through,” said Regional Council Coastal Catchments Manager Pim de Monchy. “We’re grateful for the co-operation and support we’ve received from local residents, tangata whenua, river users, fishers and Western Bay of Plenty District Council to date. It will mean we can complete the work and get public access, and the health and mauri (life force) of the estuary restored as quickly as possible,” Mr de Monchy said. Ford Road access to the Kaituna River mouth and Maketū Spit will be closed to the public between 7am and 7pm on weekdays and Saturdays from 8 February until 27 May 2019. The road will be open for public use all day on Sundays. “If people want to enter before 7am and stay at the road-end all day on weekdays or Saturdays, they’re very welcome to. They just won’t be able to leave until the road re-opens at 7pm,” Mr de Monchy said. Locals are invited to inspect project progress for themselves at a construction site walking tour and community update meeting on Wednesday 13 February. The tour will leave from 83 Ford Road at 5.30pm. The meeting will follow from 6.30pm at Tukotahi Marae (also at 83 Ford Road). Mr de Monchy said that construction of the new replacement stop bank west of Ford Road is almost complete, the last row of Ford Road culverts are currently being installed, and excavation of the new re-diversion channel is well underway. “There’s still a lot of work to do, and a range of factors including weather and unforeseen ground conditions could impact on final timeframes, so the forecast completion date remains set for June 2020. But if current progress continues we may be able to finish the work sooner,” Mr de Monchy said. Further project videos, updates and information are available at www.boprc.govt.nz/kaitunarediversion.